One area I’ve been investigating are the issues from The Honolulu Mint prior to its bankruptcy in 2005. So far I have identified 68 coin issues before 2005. Majority of these issues were struck as custom issues. Custom issues are struck for a specific organization and do not have either: The Honolulu Mint’s hallmark nor designer’s hallmark. Other coins have been struck specifically for inclusion with jewelry (has the designer’s hallmark). From my working The Honolulu Mint spreadsheet, I can only identify one coin with the The Honolulu Mint’s name. 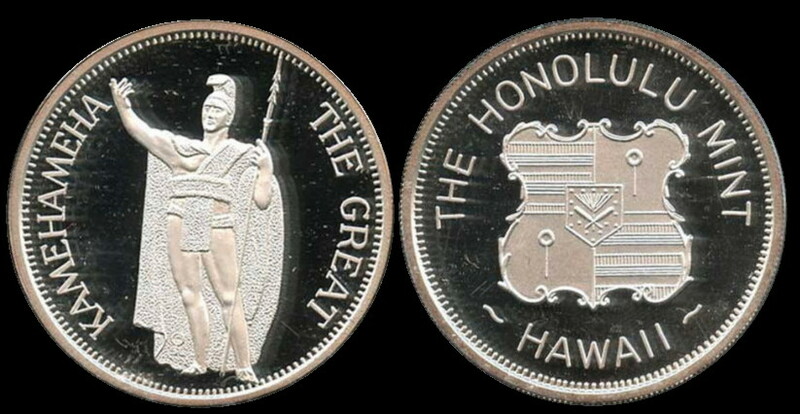 This coin is the Kamehameha the Great 1 ounce fine silver coin. This coin is 1 troy oz of .999 silver., proof, 39.2 mm in diameter.